Alexa stats up to August 17 show a massive rise in traffic to Skype competitor Gizmo Project and a more modest rise for Grand Central at the peak of this weeks 36 hour Skype outage. The SIPphone owned Gizmo Project offers a nearly identical package to Skype, but with added features including built in recording, and cross platform compatibility. Gizmo’s traffic tripled in the space of three days and rose to a rank of 8,561 in Alexa from a 3 month average of 19,102. The Google owned Grand Central offers a one number everywhere telephone service. Whilst the service doesn’t compete with Skype in the softphone market, the service does provide functionality that competes with Skype services such as Skype In. 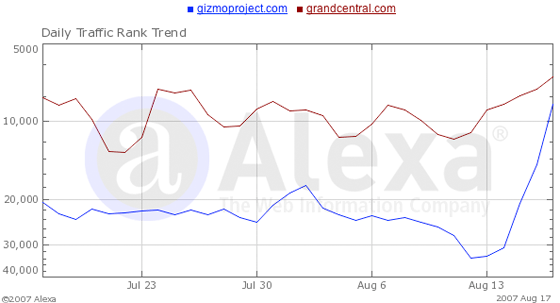 According to Alexa, Grand Central hit a 4 week high on Friday with a 33% increase in rank over its 3 month average.